The average student will now borrow £45,000 and accrue £5,800 of interest while studying, leaving them with a debt of £50,800 on graduation. This places English graduates as the most highly indebted students in the developed world. And unsurprisingly it is poorer students who carry the greatest burden; students from the poorest 40% of families accumulate debts averaging £57,000. As thousands of young people leave home for the first time during freshers’ week, their debts sit as a dangerous weight on their shoulders. No previous generation in the U.K. has been faced with student debts of this scale and we’re only beginning to see the consequences. One survey found that three quarters of students who receive maintenance loans feel stressed about the levels of debts they are accumulating. The majority of their income is spent on rent, food and utility bills, but many reported being unable to afford their weekly food shop and almost one third had missed rent payments. Worryingly, a significant proportion of students surveyed said they rely on additional debts to make ends meet, with 6% relying on credit cards, 9% turning to payday loans, and 15% having been chased by debt collectors already. The psychological stress associated with their debts has impacted on the relationships, friendships and exam results of around one third of all students. In the current economic climate, following the longest period of wage stagnation since the 19th century, along with increasing underemployment and precarity, we expect graduates on low and middle incomes to see interest on their student loans accruing faster than their repayments. This accumulating debt burden is likely to have significant detrimental impacts on graduates from low income backgrounds and it will only compound a growing crisis of household debt in the UK. The Jubilee Debt Campaign are calling for urgent and major changes to reduce the student debt burden. If you care about this issue and would like to take action we urge you to join our mailing list. 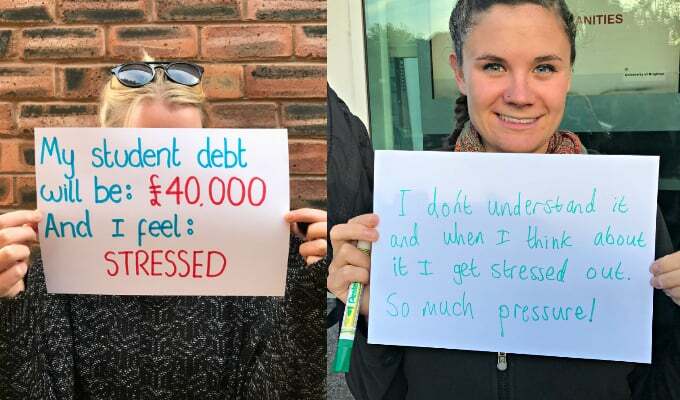 If you have been directly affected by student debt and you are willing to share your experience or your thoughts please tweet us @dropthedebt or use #MyStudentDebtIn4Words – the more testimonies we can gather the stronger the campaign will be. If you need urgent debt advice contact the National Debtline or these sources of independent advice for students in the UK.